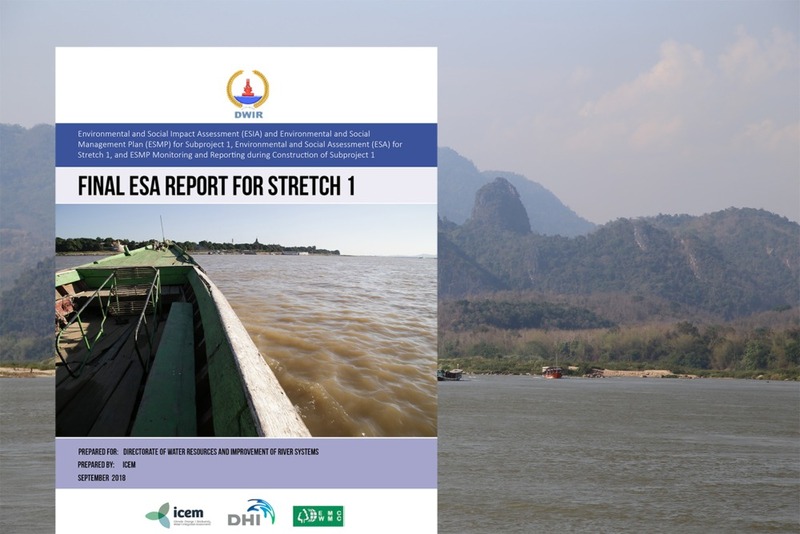 More frequent flooding, drought, storms and other natural hazards are on the cards for many towns and cities in the Greater Mekong Subregion (GMS). Combined with rapid expansion of urban populations and infrastructure, urban planners must be able to assess disaster risk and threats associated with climate change in a holistic and integrated manner. In November and December 2016, a series of training workshops in three countries – Vietnam, Lao PDR and Cambodia – took participants one step closer to achieving this. Organized as part of the Second GMS Corridor Town Development Project: Integrated Disaster Risk Management (IDRM), the workshops aimed to build capacity in provincial and city government agencies to mainstream IDRM into strategic local economic development planning. It followed on roundtable meetings in August and September that included site visits to seven towns across the three mentioned countries. 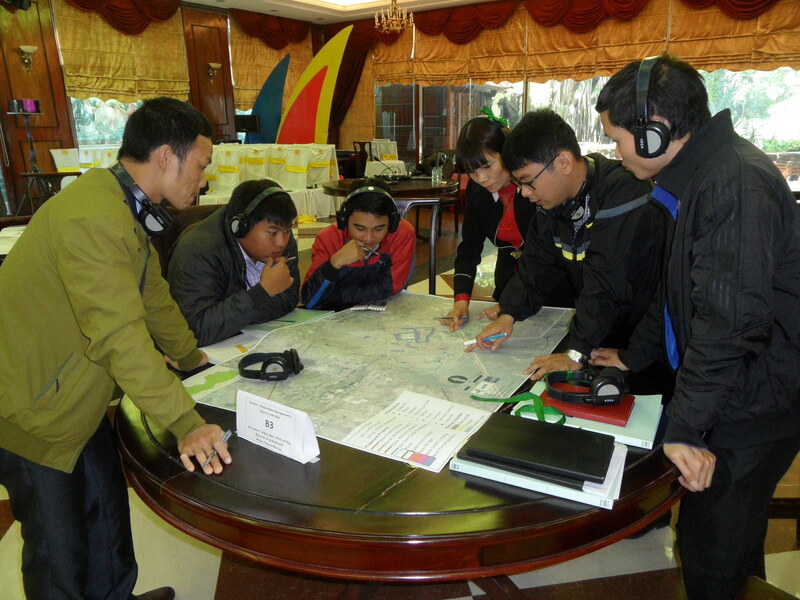 Carried out in Sihanoukville (Cambodia), Houayxay (Lao PDR) and Bac Giang (Vietnam), the recent risk assessment workshops introduced disaster risk screening tools, known as Climate Change Adaptation and Mitigation (CAM), to Technical Core Group (TCG) members. ICEM’s CAM applies a systematic science-based method to identify adaptation measures which build urban climate resilience and provide a pathway for implementation of adaptation and mitigation on a phased basis. Although the tool was designed for climate change assessment and adaptation planning, it is adapted for this project to include non-climate change related natural hazards such as earthquakes. The modified CAM uses baseline data collection, GIS analysis and participatory mapping to conduct broad, town-wide risk assessment and detailed assessment on selected case study sites. 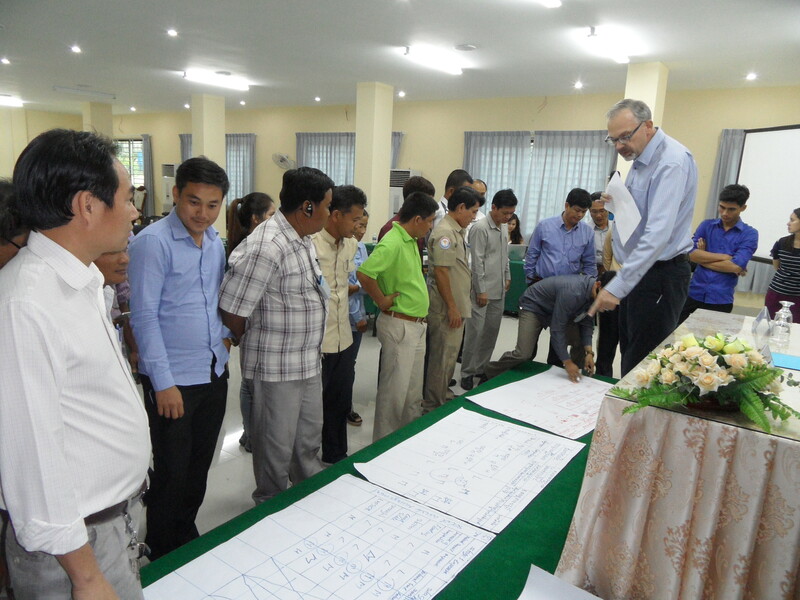 Technical experts introduced CAM to participants at workshop in Sihanoukville, Cambodia. The workshops were intended to teach participants how to use this tool to assess sector specific vulnerabilities and the risks to infrastructure sites in their respective towns. In addition, results of baseline assessments from the first round of workshops were presented, allowing participants to understand threats from natural hazards and climate change to their towns. TCG members were a mixture of technical staff and management from provincial, city and government authorities, relevant national and provincial departments, technical offices, NGOs and private sector. They were divided into two groups based on their interests and expertise; one focusing on urban roads and another on drainage and solid waste management. Through a series of presentations and group exercises, they learnt how to use CAM to identify types of hazards and analyse the impacts from both natural and climate hazards in different stages on physical and non-physical infrastructure. 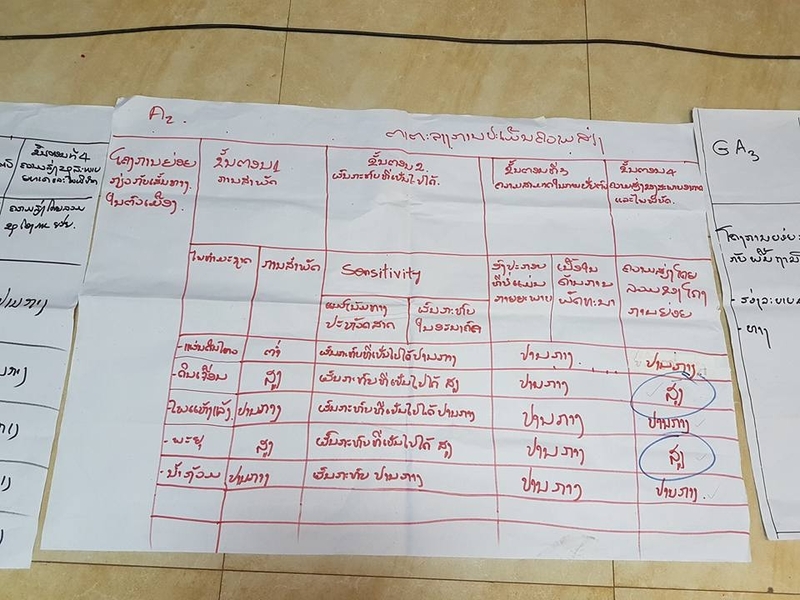 A risk assessment matrix of a group that focused on urban roads and drainage during the workshop at Houayxay, Lao PDR. After reviewing case studies of ADB key infrastructure subproject sites, the two groups had the opportunity to visit urban roads and drainage and solid waste management (landfill or dump) sites. During the site visits, participants met with local authorities, interviewed communities and conducted site surveys in order to gain a variety of different perspectives of the sites’ challenges and issues. Based on their observations, participants then carried out risk assessments on two selected infrastructure subprojects using the CAM tools. 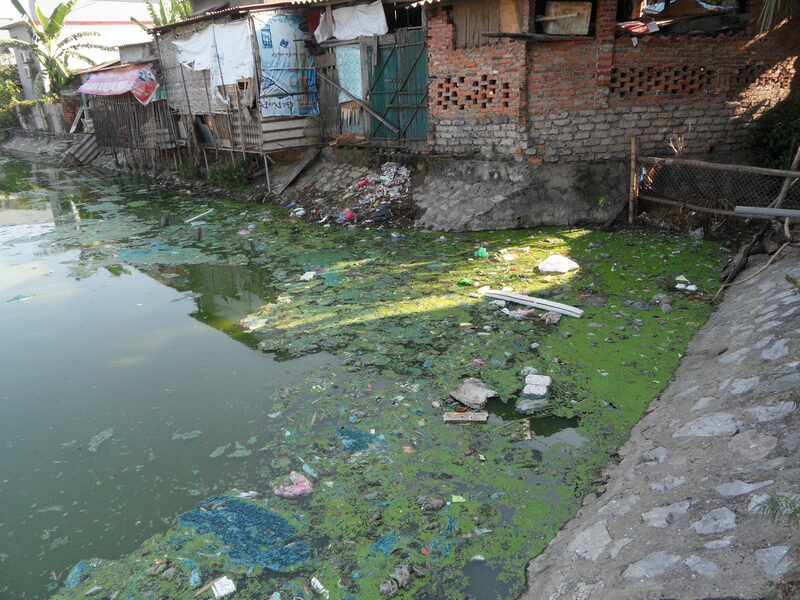 Waste accumulation at one corner of the Nha Dau drainage lake in Bac Giang, Vietnam. The overall assessment showed that both urban road and drainage and solid waste management sites were poorly managed and lacking in resources. Issues raised included illegal waste disposal, illegal settlements, poor waste collection services and improperly functioned drainage, among others. The long-term expected result of the project is to increase participant’s knowledge of IDRM, so that they can apply this knowledge to assess future risks and threats to new infrastructure investment. This will lead to better urban planning and improved urban services in their towns and also in the region. The next round of workshops will take place in February 2017. The project is set to conclude in March 2017.